Jagged Little Pill is like a Nineties version of Carole King's Tapestry: a woman using her plain soft-rock voice to sift through the emotional wreckage of her youth, with enough heart and songcraft to make countless listeners feel the earth move. 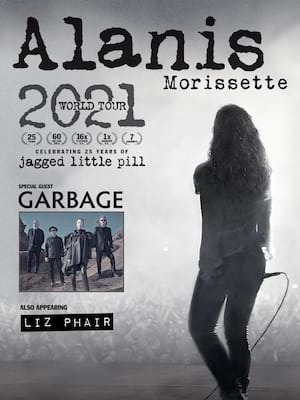 In 1995, Alanis Morrisette released her epic alt-rock masterpiece, Jagged Little Pill, displaying an evocative talent in song writing and emotional resonance. As the soundtrack to a generation, this 33 million selling album cemented Morrisette as a definitive 1990s rock powerhouse. In the years since, her sound has evolved from the original anguished and loud grief that connected her with audiences. Since the release of the excellent Havoc & Bright Lights in 2012, she has focused on more intimate and touching tunes that deal with motherhood and maturity that still retain the bitter-sweet landscape of her anthemic back catalogue. See the unique Canadian singer-songwriter at her best when she performs live in a city near you! Sound good to you? Share this page on social media and let your friends know about Alanis Morissette at Humphreys Concerts by the Beach. Please note: The term Humphreys Concerts by the Beach and/or Alanis Morissette as well as all associated graphics, logos, and/or other trademarks, tradenames or copyrights are the property of the Humphreys Concerts by the Beach and/or Alanis Morissette and are used herein for factual descriptive purposes only. We are in no way associated with or authorized by the Humphreys Concerts by the Beach and/or Alanis Morissette and neither that entity nor any of its affiliates have licensed or endorsed us to sell tickets, goods and or services in conjunction with their events.